What Is Dry Ice Cleaning? What are the benefits of Polar ICS? The system used is non-toxic, non-conductive and non-abrasive. Dry ice vaporises immediately on contact with treated surfaces which gives unique advantages in comparison with traditional blasting methods. Traditional cleaning methods can require machinery to be disassembled and moved to a designated cleaning area. Dry ice blasting often allows production equipment to be cleaned whilst in operation, without the need for either disassembly or cool down/drying time, so costly periods of production downtime are drastically reduced. Dry ice blasting is a completely dry process. It works without chemicals, solvents and water. It is the perfect cleaning solution for electrical equipment, machinery and other water sensitive applications. With our wide range of nozzles normally inaccessible areas can be cleaned effectively, which can result in fewer cleaning cycles and less downtime. Dry ice blasting eliminates the need for pre-soaking in the cleaning process. When combined with extremely high cleaning speeds of the system, this results in a faster clean and less downtime for your business. The system produces no waste products apart from the coating that has been removed. This can be swept or vacuumed from the floor. Traditional cleaning methods can result in hours of additional “clean up” which can often be worse than the original problem. Surfaces are treated extremely gently by the dry ice blasting process so the wear and tear associated with other cleaning processes is avoided. It can be used on easily damaged surfaces such as nickel, chromium and soft aluminium. With the advancements in technology and mass production, there are still cleaning methods that damage, rather than help the environment, adding thousands of tonnes of harmful secondary waste into our landfills and water ways. Dry ice blasting eliminates secondary waste as the blasting agent sublimates (turns from solid to a gas) upon impact. Because it simply disappears, it eliminates the costs or concerns of more traditional methods. The CO2 used to produce dry ice is obtained as a by-product from other industrial production processes. This means that dry ice blasting does not add CO2 to the atmosphere and does not contribute to climate change. 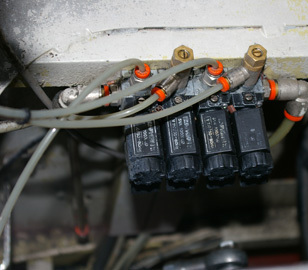 Images are of a solenoid control pack belonging to a Sorma punnet netting machine being used to pack various types of stone fruit. The pack is situated within the main frame of the machine out of reach of anyone using a brush or standard airline to clean the machine down. 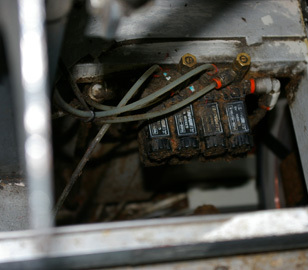 It was covered in netting debris that was being held in place by a small amount of oil leaked from the automatic lubricating system. Making best use of the soft touch capabilities of the dry ice blasting system we were able to remove all the dirt and oil from around the solenoid pack without causing any damage to the airlines etc.